I was only eight years old the first time I stepped foot on the Amalfi Coast, and many of my memories of the place are striking and vivid—as if I had just come back from a trip. But because I was so young, others are fleeting and imperfect. I remember sneaking a sip of limoncello (a liqueur made from lemon peels) as my parents looked away and finding its syrupy, neon-yellow taste far too sweet for my liking. (Today, I’d never turn down an after-dinner sip of the stuff.) I have flashbacks of my mother clutching me as the tour bus driver whipped around the region’s steep, winding cliffs with wild abandon en route to some other coastal town, probably Sorrento. And while I can’t recall every single thing that we ate, I remember our meals being magical: oceanside terraces, fresh-caught seafood I gobbled up like candy, and all the pasta I could ever want. 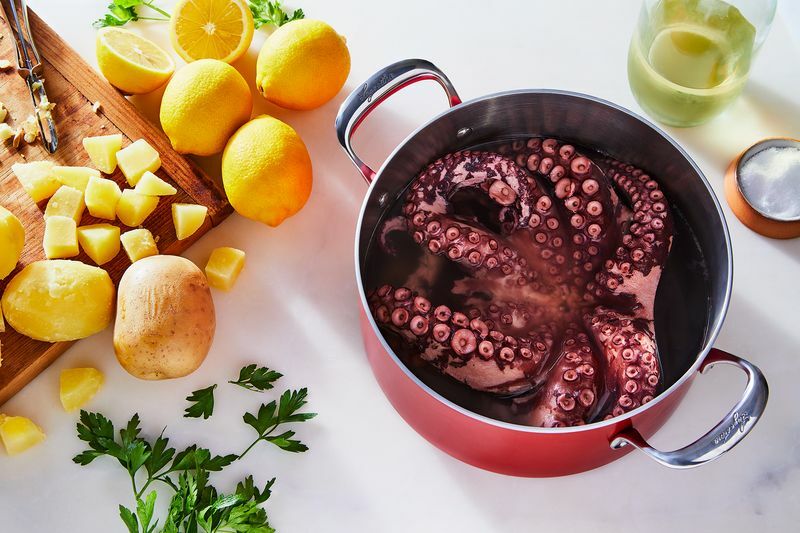 The snappy, perfectly acidic punch of lemon lightens the heft of the potatoes, and brings out the sweet, clean flavor of an octopus cooked until tender in a Lagostina pot. But while many of these experiences only come back to me after flipping through an old photo album, there’s one moment—and smell—I’ll never forget: the lemons. It was the summer, so the lemons were ripe on the vine and the size of my head (or at least they seemed like it at the time). I vividly recall walking through lush, terraced groves; the intoxicating smell of pure lemon was everywhere. Then, our tour guide offered me a bite of one. I hesitated, since every lemon I had tasted before this had been sour, but took one anyways. It was sweet! And juicy, too. It was the most refreshing piece of fruit I had ever tried. Ever since, whenever I make anything with lemons—even when they’re not Amalfi’s famous sfusato lemons, which are bigger and sweeter than the varieties you’ll find in your grocery store—I’m taken right back to the Italian coast, the Mediterranean waves lapping up against the rocky shore and the scent of lemons in the air. Here, I’ve collected a few of my favorite lemony dishes, like the octopus and potato salad above, a tastes-like-the-ocean dish you can find all along the Italian coast. The soft potatoes, thinly sliced celery, and fresh parsley make the perfect complement to octopus that’s gently simmered in white wine until tender (read: not chewy). If you’re lucky enough to get your hands on some real Amalfi lemons when they’re in season—which is coming to a close now, after summer’s peak—use them! That being said, unwaxed organic or Meyer lemons are a decent substitute for when you can’t make a trip to southern Italy.